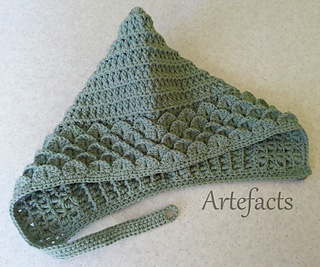 This is a lovely, textural hat with an unusual (but easy) rib stitch for the main part of the hat, and a wide edging of ‘scales’ (crocodile stitch) to frame the face. 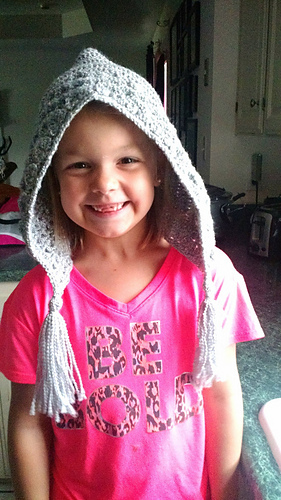 This pattern uses a strap and button to keep the hat on your head, but you can change that yourself to crocheted or braided ties, or none at all, as you desire. 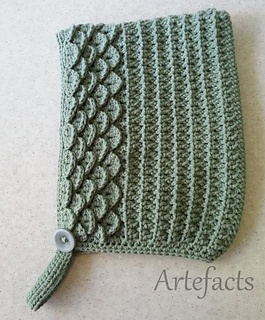 It is made in one piece, without seams and without breaking off the yarn, until you get to the end. A 25mm (1 inch) button is required if you choose to follow the pattern, or you could use a toggle or a smaller button if you prefer. It is available in both US and UK terminology. Any 8 ply (double knit) yarn could be substituted as long as the gauge works out to be close to the pattern requirements. I would say this is an intermediate project, because it requires knowledge of foundation half dc/half treble and foundation dc/treble.